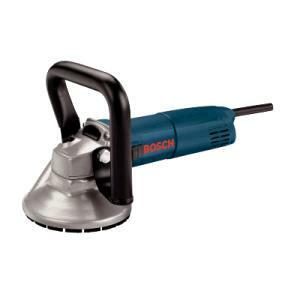 Hand Held Electric Concrete Grinder with a 5" diamond wheel. for removing concrete in small, confined areas. This grinder uses 120 Volts/10 Amps. Diamond wheel turns at 11,000 RPM. Equipped with a vacuum horn to attach a vacuum if a dust free environment is required. * Please call us with any questions about our conc grinder 5 inch el. hand held rentals in Oak Grove MO, Blue Springs MO, Independence MO, Lexington MO, Odessa MO, Independence MO and Western Missouri.